South Africa has twice, in recent times, been classified as Junk status; this means that we have plunged, financially, below investment grade. Our poor financial crisis, corrupt political system, polluted air, negligent parents and dire straits are all scrutinised in this new South African play, Junk Status. Written and performed by the ever-so-suave Vedarsha Singh and directed by the oh-so serene Donna Steel, this play, while amusing and very entertaining, forces us to question our everyday actions. The pair make a great team as they manage to successfully mesh stand-up comedy, monologues and even dance into this witty wonder. 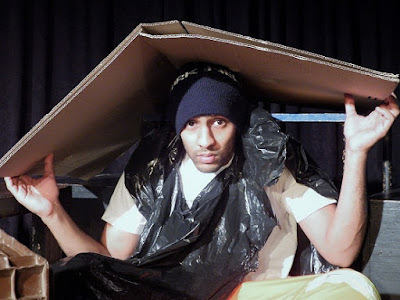 We are met by the ghastly sight of filth and rubbish all over the stage and theatre and as the action begins, buried under some trash, emerges a vagrant … one of the many characters that Singh explores to great success. The silence of the vagrant speaks volumes about the lack of voice that we all feel when listening to the state of affairs in our country at present. One of my favourite characters was a little confused boy, dealing with the pressures of not sounding like the rest of his Indian friends, the strained father/son relationship that he experiences and the neglect faced by kids who are abandoned by parents seeking fortunes at Suncoast. While I felt that some of his rhythms were monotonous, Singh does very well to glide into the world of each character and reveal to us something pertinent about personal and public politics. The filth of reality and the stench of powerlessness are a rude awakening concocted by Singh.